My objective in this brief article is to compare how much time and effort is spent on certain information-related activities in an organisation that has adopted best practice, compared to what is typical in all too many organisations. For the avoidance of doubt, when I say people here I am focussing on staff who would ostensibly be the consumers of information, not data professionals who are engaged in providing such information. What follows relates to the end users of information. What I have done at the top of the above exhibit (labelled “Activity” on the left-hand side) is to lay out the different types of information-related work that end users engage in, splitting these into low, medium and high valued-added components as we scan across the page. In the centre of the diagram (labelled “Ideal Time Allocation”), I have shown what I believe is a best practice allocation of time to these activities. It is worth pointing out that that I am recommending that significant time (60%) is spent on analysis and interpretation; while tagged as of medium-value, this type of work is a prerequisite for the higher value activities, you cannot really avoid it. Despite this, there is a still 30% of time devoted to the high-value activities of action and monitoring of results. The remaining 10% is expended on low-value activities. At the bottom of the chart (labelled “Actual Time Allocation”), I have tried to estimate how people’s time is actually spent in organisations where insufficient attention has been paid to the information landscape; a large number of organisations fit into this category in my experience. I am not trying to be 100% precise here, but I believe that the figures are representative of what I have seen in several organisations. In fact I think that the estimated amount of time spent on low value activities is probably greater than 70% in many cases; however I don’t want to be accused of exaggeration. Clearly a lack of robust, reliable and readily available information can mean that highly skilled staff spend their time generating information rather than analysing and interpreting it and then using such insights as the basis for action. This results in the bulk of their work being low valued-added. The medium and high value activities are squeezed out as there are only so many hours in the day. It is obvious that such a state of affairs is sub-optimal and needs to be addressed. 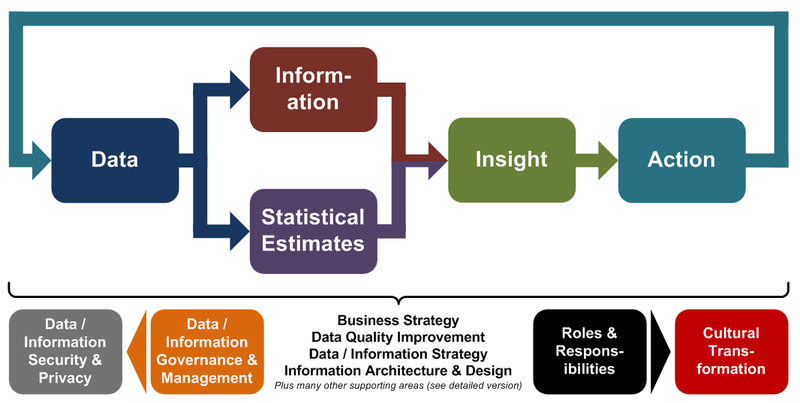 My experience of using diagrams like the one shown here is that they can be very valuable in explaining what is wrong with current information arrangements and highlighting the need for change. An interesting exercise is to estimate what the bottom of the diagram would look like for your organisation. Are you close to best practice, or some way from this and in need of urgent change?